The HP iPAQ 914c (£369 inc. VAT) is part of the company's Business Messenger range, and is similar in style to the original RIM BlackBerry. Touches of chrome around the edges help to lift it above the mundane, and a matt ﬁnish to the rear makes it easier to grip. As with the BlackBerry, the display is ﬁtted in a landscape orientation, creating plenty of space below it for a full QWERTY keypad. The screen measures 2.4-inches, and features a standard 320 x 240-pixel resolution. Offering width over height, it's easier to view web pages and documents, and it's more than bright enough for use in all conditions. The keypad is particularly good for a handset of this size. The keys are big enough to type at speed without fear of mistakes, and the provision of dedicated buttons for basic punctuation marks makes it much easier and less time-consuming to write emails. The 914c runs Windows Mobile 6.1, and navigation can be carried out in a variety of ways. The most intuitive is the four-way directional pad in the centre of the handset, and there are large shortcut buttons on both sides. You'll also be able to control the iPAQ using a wheel on the right-hand side, or with the touchscreen and stylus. Call quality proved excellent, and the HP excels when it comes to connectivity. Those sending and receiving emails when out and about are catered for with the inclusion of 3G/HSDPA – offering fast download speeds – and you'll be able to switch to wireless networks where possible. Bluetooth is also included. 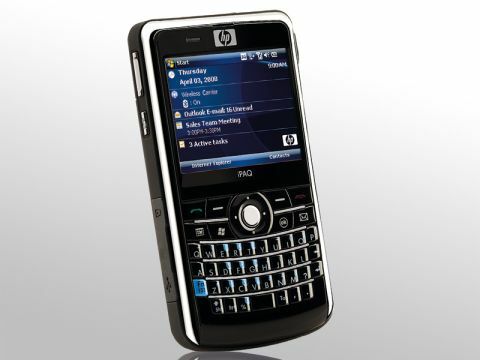 Despite its relatively thin casing, HP has packed in a GPS chip, incorporating A-GPS technology. Along with the bundled Google Maps software, it turns the iPAQ into a handy satellite navigation device. Other features include a 3-megapixel camera. Photographs were detailed, if a little muted in colour. Internal memory is average, with 256MB of ROM, and 128MB of space for applications and ﬁles. You'll also be able to slot in a Micro-SD card. Located on the right side of the iPAQ, it's easy to swap cards without having to turn off the handset or remove the battery. The battery life on our iPAQ was its biggest ﬂaw, needing a recharge after just 24 hours. The unit we had was a preproduction sample, however, and HP was keen to point out it's not representative of production models. Despite these ﬂaws, the HP iPAQ 914c is an excellent handset. With great connectivity backed by equally impressive usability, it's the ideal tool for those constantly on the road.